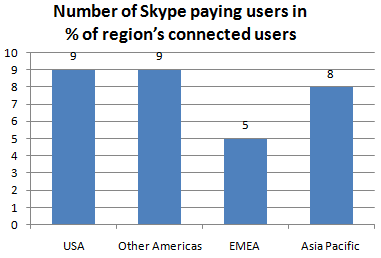 I graphed some of the data of Skype’s March 4 update, see also my previous post. 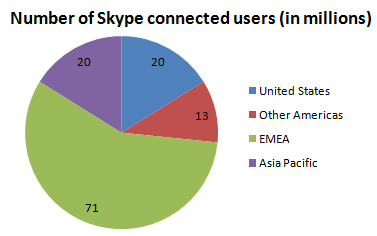 The first graph is the number of “connected users” or in other words the number of active users according to Skype’s own estimates. 124 million users are “connected”. As they say themselves, this is probably an overstatement of the real number of active users. A pity that they put Africa in the same zone as Europe and the Middle East (see the EMEA pizza slice), because Africa is a quite different continent (demography, internet penetration, etc.). Europeans are the champions, with 71 million, more than all other zones together! The second graph is the percentage of internet users of the concerned zone who are using Skype. 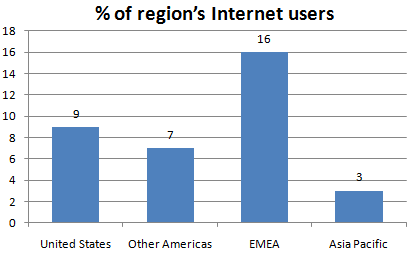 16% of European, Middle Eastern and African internet users are using Skype, compared to only 9% of Americans. We are again the champions (I am European ;-)! Last, are the Asians, with only 3%. This seems to confirm my previous post that shows a disappointingly low number of Chinese users. The next graph is the amount of paying users by zone. 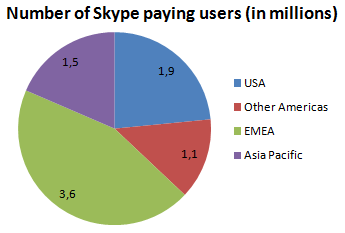 Only 8.1 million people pay for Skype services, or only 6.5% of active users. Again, EMEA wins, but here the “Other Americas” loose, only 1.1 million paying customers! And then the last graph is a surprise: compared to the other zones, A quite lesser proportion of EMEA connected users pay for Skype services, only 5%, compared to about 9% in the other zones. Possible reasons? Perhaps the weight of African users with less economical power influences that number downward. Other reason could be that, because of the higher internet penetration of Europe, more people can make free Skype to Skype calls, and therefore do not need to pay. Third guess: the countries in that zone are smaller, people call mostly in their country, and the phone calls fare is competitive compared to the Skype price per minute (my case in Belgium!). But, this are only guesses. Download counter down again and again! 20 million active Chinese Skype Users?